Have you ever wanted to take your pochette friend from Angelic Pretty or bring your favorite stuffed animal to a tea party? We got great news for you! Angelic Pretty San Francisco presents: My Frilly Valentine afternoon tea at the Rotunda! 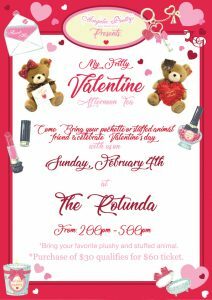 Bring your stuffed animal/Pochette for a fun tea time with other frilly friends. Play games and win some prizes! The event will be on Sunday, February 4th at 2:00pm ~ 4:30pm! So make sure you mark that on your calendar! **Ticket** Purchase over $30 will qualify to purchase $60.00 Tea Party Ticket. Qualifying purchase must be made at Angelic Pretty San Francisco store or click here to purchase the ticket online!